“Living in South Carolina Article” from 1999. Guerry Green, an entrepreneur from Pawleys Island, is taking his innovative business. Screen Tight, to new heights by introducing a brand-new. all-vinyl screen door. Guerry Green has heard it a thousand times: “I wish i thought of that” Green, Inventor of the patented Screen Tight porch screening system, was working construction when he figured out a better way to screen a porch. His Ingenious two-part system consists of a base strip that attaches to a wood frame after screen is rolled into place into the base strip with spline and a screen roller, the second part, a cap, snaps in place over the base. The result is a low maintenance screen with vinyl trim that never needs painting. The screen does not sag-and looks better then conventional screening. Plus, it’s forgiving You can re-roll Screen Tight screening to tighten it. Whereas screen installed the old way is ripped out once stapled-and ruined. 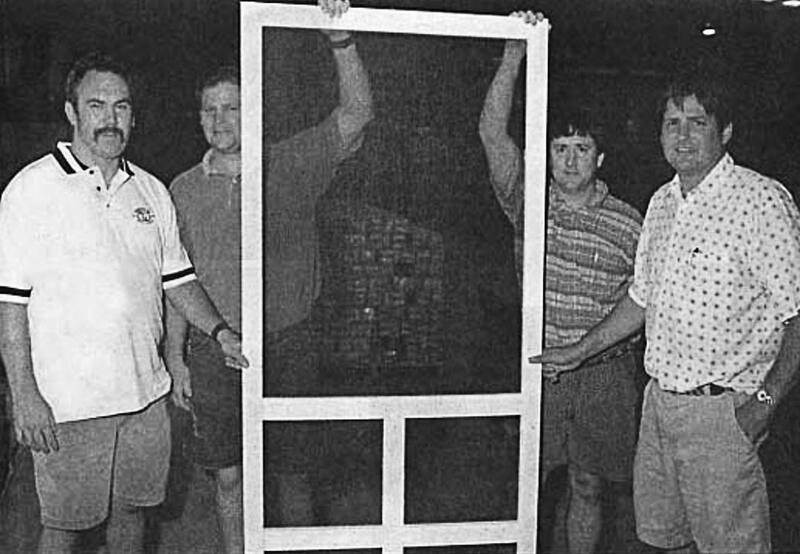 While remodeling homes in the Charleston area after graduating in 1982 from University of South Carolina, Green became familiar with the resin-based products used in sunrooms and other type of additions. He gradually developed the first prototype of Screen Tight, and then another. But it wasn’t long before Green realized his aim of developing a niche in the building materials industry and switching careers from user to supplier. Green credits the testimony of a Charleston area architect, for helping get his system patented. The fact that the architect’s oceanfront home on Sullivan’s Island was badly damaged during Hurricane Hugo, except for the screen porch equipped with Screen Tight. impressed the patent examiner who saw the usefulness of Green’s idea. Green launched the Georgetown-based business in an old garage on Fraser Street in 1991, when he still hired out the making of the vinyl Screen Tight system components. From there, he moved operations in 1994 to a building that formerly housed the Rodwell Cadillac dealership on St. James Street. Thanks in part to the help of Santee Electric Cooperative, which provided funding through the Rural Development Act for installation of water and sewer lines. Screen Tight moved into a new manufacturing and office facility in December 1998. The new Screen Tight plant operates 24 hours, seven days a week. Located on U.S. 17, the 42,000-square-foot facility has 45 employees. The South Carolina-made Screen Tight system is sold in 2,000 stores nationwide, including Ace, HWI. Home Depot, Home Quarters Lowe’s, Builder Marts of America, Lumberman’s Merchandising Corporation. Pelican Lumber and true Serve. The Screen Tight system has been featured by several national home magazines and has appeared on television. Nearly a decade after his Screen Tight system was patented, Green has introduced a line of solid vinyl screen doors. They are ready to hang doors with a frame made from cellular vinyl, giving the door the same feel and texture-even the same characteristic slap when sprung to close—as a wooden screen door. Green feels that the new screen doors will be a bigger hit than the Screen Tight system. “I think it will be bigger because not everybody’s got a screen porch, but screen doors are everywhere,” he says. Green suggests that his new product will have a definite impact on the industry—an industry that has driven production of cheap wooden screen doors for some time. Many are imported and made from scrap. Mean while, value-conscious consumer; are increasingly turning to products that require less in die way of maintenance and replacement “There’s a lot of interest in saving time and money.” Green observes. The vinyl screen doors compete with medium priced wooden screen doors, which have a shorter lifespan because of their natural tendency to warp or rot. 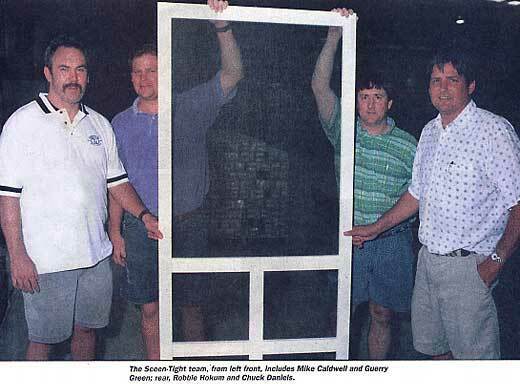 The vinyl screen door was in development for three years until its rollout in April 1999. After Green moved the company’s operations into the new plant in early December. The development team includes Robbie Hokum of Mi.Pleasant, Chuck Daniels of Georgetown and MikeCaldwell of Mi. Pleasant. The cellular vinyl material Used to frame the screen door allows it to be cut like wood. Screen Tight has invested in sophisticated computerized furniture milling equipment to boost efficiency in the production of door-frame components. In addition to the Screen Tight system and vinyl screen doors, the company produces screening accessories, components for window screens as well as providing custom profile services. For the future. Screen Tight has plenty or room for expansion. The new plant uses but a small fraction of the 10-acre tract south of Georgetown. » Download printable pdf file.